A young Kenyah family in East Kalimantan, pre-1944. 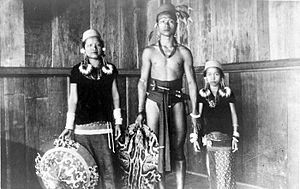 The Kenyah people are an indigenous, Austronesian-speaking people of Borneo, living in the remote Baram (Lio Matoh, Long Selaan, Long Moh, Long Anap, Long Mekaba, Long Jeeh, Long Belaong, Long San, Long Silat, Long Tungan, etc. ), Data Kakus, Data Surau, Senap River, Long Dungan, Long Busang, Long Beyak, Bintulu, Miri, Asap River resettlement for Bakun Dam, Long Bulan, Long Jawe and Belaga regions in Sarawak, Malaysia and the remote Apau Kayan, Bahau (Bau), Benua Lama, Benua Baru and Mahakam regions in East Kalimantan, Indonesia. The Kenyah people, traditionally being swidden agriculturalists and living in longhouses (uma dado'), is an umbrella term for over 40 sub-groups that mostly share common migration histories, customs and related dialects. Kenyah people lived in longhouses in a small communities. Each longhouse consists of families who choose their own leader (headman). When they have any event or celebration such as harvest festival they will normally use the longhouse verandah (oseh bi'o) to gather and deliver speeches to guide their youngsters. Normally this harvest festival celebration (tau bio Ramay o o Ajau, pelepek uman) is a major festival because most of them are still farmers. Kenyah people are very creative and they also have composed their popular songs and melody such as Lan e Tuyang, Kendau bimbin, Ilu Kenyah Kua Lo Te'a, Pabat Pibui, Atek Lan and Leleng Oyau Along Leleng. Popular traditional Kenyah musical instruments are such as jatung utang (wooden xylophone), sampe (a type of guitar), sampe bio (single stringed bass), lutong (a four- to six-string bamboo tube zither) and keringut (nose flute). Christianity is the predominant religion of Kenyah people, with the majority belonging to the Roman Catholic faith. Before the arrival of Christian missionaries, the Kenyah people practice a traditional form of animism called 'Bungan Malan Peselong Luan'. However, today are only a small number of Kenyah people who still practice the Bungan faith. It is believed that a person will ascend to Alo Malau (seven heavens) with their ancestors (tepun) after death. Statistical figures, based on the Indonesian and Malaysian national censuses collected in 2000, recorded a total of 44,350 Kenyah people in East Kalimantan, Indonesia and 24,906 in Sarawak, Malaysia. The Usun Apau (aka Usun Apo) plateau (in the Plieran river valley) or Apo Kayan Highlands (a remote forested plateau in Malaysian and Indonesian border) in the present-day Indonesian province of East Kalimantan and Malaysia's Sarawak is believed by the Kenyah people to be their place of origin; which was the largest concentration site of Kenyah populations between the late 19th century to the early 1980s. The Kenyah languages are a small family of Austronesian languages. Their language is called Kenyah. Larissa Ping Liew, Miss World Malaysia 2018. She is of Malaysian Chinese-Kenyah parentage. The late Raymond Abin, Environmentalist and social activist, Asian representative of the International Alliance of Indigenous peoples to the UNDRIP, Geneva, 2004-2006 and founder of Borneo Resources Institute Malaysia. ^ William W. Bevis (1995). Borneo Log: The Struggle For Sarawak's Forests. University of Washington Press. ISBN 9780295974163. ^ a b Wil de Jong, Denyse Snelder & Noboru Ishikawa (2012). Transborder Governance of Forests, Rivers and Seas. Routledge. p. 54. ISBN 11-365-3809-7. ^ Paul C. Y. Chen, ed. (1990). Penans: The Nomads of Sarawak. Pelanduk Publications. p. 35. ISBN 96-797-8310-3. ^ Bagoes Wiryomartono (2014). Perspectives on Traditional Settlements and Communities: Home, Form and Culture in Indonesia. Springer Science & Business Media. p. 170. ISBN 98-145-8505-X. ^ Reimar Schefold, P. Nas & Gaudenz Domenig (2004). Indonesian Houses: Tradition and transformation in vernacular architecture. Singapore University Press. p. 318. ISBN 99-716-9292-9. ^ Terry Miller & Sean Williams, ed. (2011). The Garland Handbook of Southeast Asian Music. Routledge. p. 412. ISBN 11-359-0155-4. ^ Margaret J. Kartomi (1985). Musical Instruments of Indonesia. Indonesian Arts Society. p. 51. ISBN 09-589-2250-0. ^ Musicworks, Issues 73-78. Music Gallery. 1999. p. 12. ^ The Sarawak Museum Journal, Volume 40, Part 3. Sarawak Museum. 1989. p. 132. ^ "Languages of Borneo". Digital Atlas of Indonesian History. Retrieved 2015-01-07. ^ Hugo Steiner (2007). 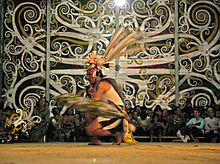 Sarawak: people of the longhouse and jungle. Opus Publications. p. 77. ISBN 98-339-8701-X. ^ "LELENG-LELENG". YouTube. Retrieved 2014-11-29. ^ "Leleng". YouTube. Retrieved 2014-11-29. ^ "Ake' Mimbin Iko' Tuyang". YouTube. Retrieved 2014-11-29. ^ "Pabat Pibui". YouTube. Retrieved 2014-11-29. ^ "Former minister Balan succumbs to illness". mysarawak.org. 15 March 2010. Archived from the original on 28 June 2012. Retrieved 18 August 2012. ^ "Sarawakian lass crowned Miss World Malaysia". The Daily Express. 11 September 2018. Retrieved 13 September 2018. ^ Jeremy Veno (2 September 2018). "Up close and personal with local beauties". The Borneo Post. Retrieved 13 September 2018. ^ Agus Andrianto (2006). The Role of District Government in Poverty Alleviation (PDF). The Center for International Forestry Research (CIFOR). p. 9. ISBN 979-24-4636-2. Retrieved 18 August 2012. ^ "Insurance benefit for deceased Sarawakian pastor's family". Berita NECF. Puchong, Selangor, Malaysia: National Evangelical Christian Fellowship of Malaysia: 13. March–April 2008. Retrieved 18 August 2012. ^ Vom Roy (1993). Tan Chee Beng, ed. The migration of Kenyah Badeng : a study based on oral history. Kuala Lumpur: Institute of Advanced Studies, Universiti Malaya. p. 65. ISBN 9839576186. Kaipuleohone's Robert Blust collection includes written notes on many different varieties of Kenyah. 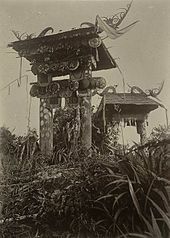 Wikimedia Commons has media related to Kenyah people.